Glasgow City manager Scott Booth is hoping the club's European experience can give them an edge over Chelsea. 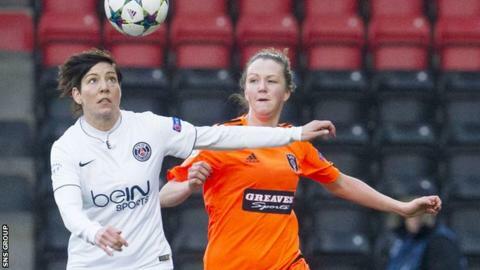 The teams meet in the last 32 of the Women's Champions League, with the first leg in London on Thursday. "Our players are looking forward to this challenge," said Booth before meeting the newly crowned Women's Super League champions at Wheatsheaf Park. "We have great experience in the dressing room and the value of that is huge in this type of competition." Chelsea completed a domestic double at the weekend, wrapping up their first title to add to the FA Cup they won in August. However, this is their debut season in Europe, while City are regulars on this stage and reached the quarter-finals of last season's tournament, losing out to Paris St-Germain. "Chelsea are a top-class team who will be full of confidence having just won the league," added Booth. "Our players want to test themselves against the best teams in Europe so this trip offers us that opportunity." The return leg is on 14 October at Airdrieonians' Excelsior Stadium. City are on course for their ninth consecutive Scottish Women's Premier League title after beating nearest challengers Hibernian on Sunday. The 2-0 win leaves them six points clear at the top, with two games remaining and a vastly superior goal difference.